Work: Admitted to the Bar of Connecticut, 1754; King’s attorney, tax collector, town-meeting moderator, justice of the peace, Norwich Connecticut; Appointed to the Superior court, 1773; Elected to provincial Upper House of Assembly, appointed to the Council of Safety, Delegate to the Continental Congress, 1776…; President of the Continental Congress, 1779-81; Lieutenant Governor and Chief judge of Superior Court of Connecticut, 1784-86; Governor of Connecticut, 1786-1796. Samuel Huntington was one of the several maverick public servants of his era, devoting nearly all of his life to public office. Self-taught, he gained admittance to the Bar of Connecticut at the age of 23, and was soon thereafter appointed King’s attorney to the town of Norwich. He served many offices and duties there until 1773, when he was appointed to the superior Court of Connecticut. Huntington was a moderate, with a distinctly upper-class bent, but he became active with the Sons of Liberty in his state in 1774. He then choose a legislative course. 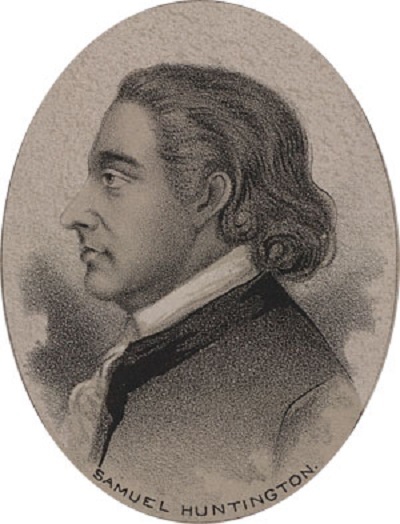 Elected to Connecticut’s Upper House of Assembly in 1776, he served on the Council of Safety, and was selected a delegate to the Continental Congress that year. He served two terms as President of the Congress during the important adoption of the Articles of Confederation. He was called home in 1784 when he was elected Lieutenant Governor if his state; an office that then included the duties of Chief judge of its Superior Court. In 1786 he was elected governor. He was very popular in the office and used his influence to develop roads and industry in the state. He was re-elected every term until his death 1796.